Need a new and interesting burger idea for your Memorial Day, 4th of July, or Labor Day get-together? Whether you’re looking for something just a little different for supper, planning a dinner party, or hosting a huge backyard barbecue, you’re sure to find a crowd pleasing burger recipe here. If you’ve watched Rachel Ray’s show, you may know that her husband John loves burgers. Stands to reason that Rachel would turn out lots of great burger recipes! I’ve searched Rachel’s website and organized the burgers for you. You can quickly read through these great burgers and see what ingredients appeal to you. When you find something promising, just click on the link, which will take you to the recipe for ingredient amounts and more specific instructions. Then get busy grilling burgers! Ingredients: Ground sirloin, shallot, parsley, Worcestershire sauce, salt and ground pepper, olive oil, butter, cremini or white mushrooms, dry sherry, Dijon mustard, eggy rolls or challah bread, watercress, cornichons or baby gherkin pickles, truffle mousse pâté. Directions: Mix meat, shallot, parsley, Worcestershire sauce, salt and pepper. Fry patties in olive oil. Sauté mushrooms in butter and olive oil and season with salt and pepper. Combine mustard and butter and spread on bun bottoms. 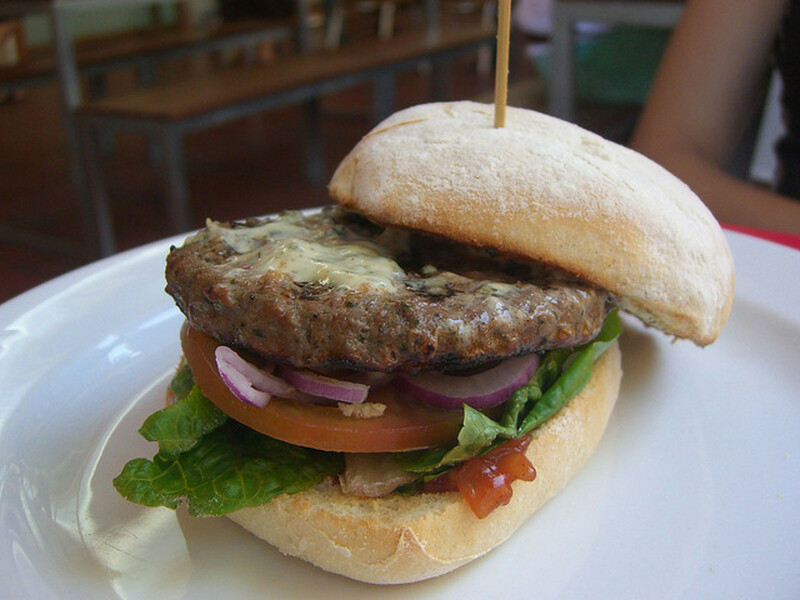 Top with burger patty, watercress, mushrooms and cornichons. Spread mousse pâté on bun tops. Ingredients: Ground sirloin, beer, garlic, chili powder, cumin, coriander, steak seasoning, Worcestershire sauce, red onion, cilantro, lime juice and peel, salt, pepper jack cheese, jalapeño peppers, tomatoes, Kaiser rolls, romaine lettuce. Directions: Combine the beef, beer, garlic, chili powder, cumin, coriander, steak seasoning and Worcestershire sauce. Grill or broil patties, tomatoes, jalapeños, and red onion. 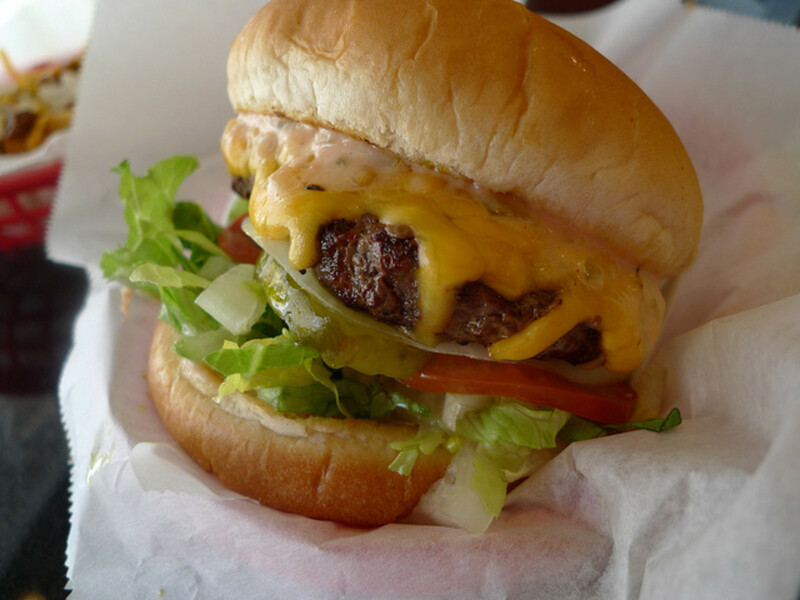 Melt cheese over patties. Chop grilled vegetables and mix with cilantro, lime juice and peel, and salt. 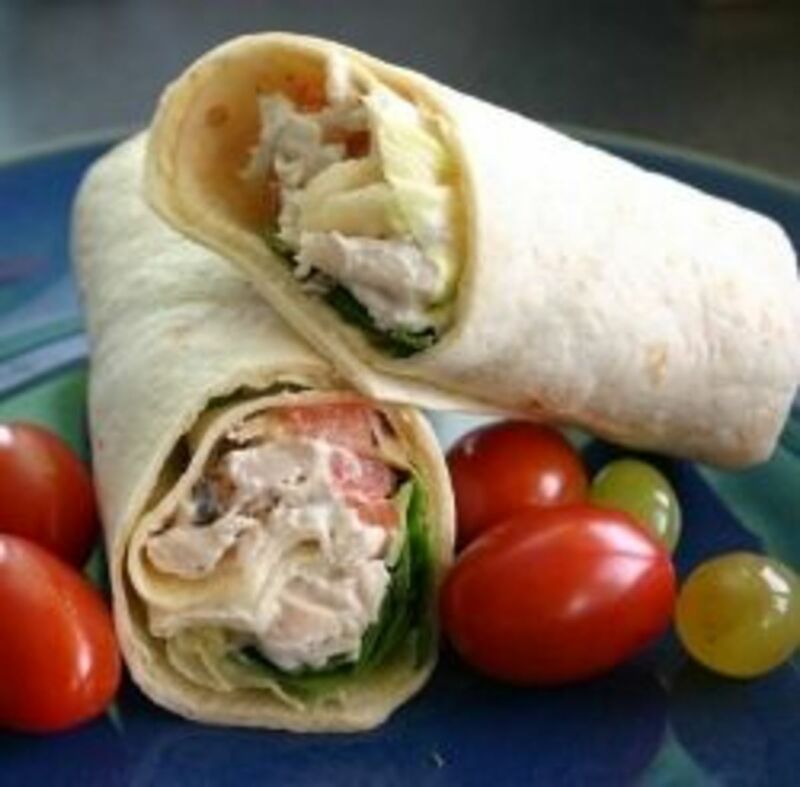 Serve patties on roll with lettuce and pico de gallo (vegetagle mixture). Ingredients: Ground beef, adobo sauce, red onion, lime juice and peel, fresh corn kernels, Kaiser rolls, mayonnaise, queso fresco (Mexican cheese), avocado. Directions: Combine the ground beef, adobo seasoning, onion and lime peel. Char corn on griddle. Cook patties on griddle. Heat rolls on griddle. Make spread for burgers with corn, mayo, cheese, lime juice and adobo seasoning. Top with avocado slices. Ingredients: Poblano chile, butter, flour, milk, Monterey jack cheese, salt and pepper, ground beef, hamburger buns, blue corn tortilla chips. Directions: Char poblano on grill. Peel, seed and chop. Melt butter and whisk in flour. Add milk and heat whisking constantly. Whisk in cheese. Season with salt and pepper. Season patties with salt and pepper and grill. 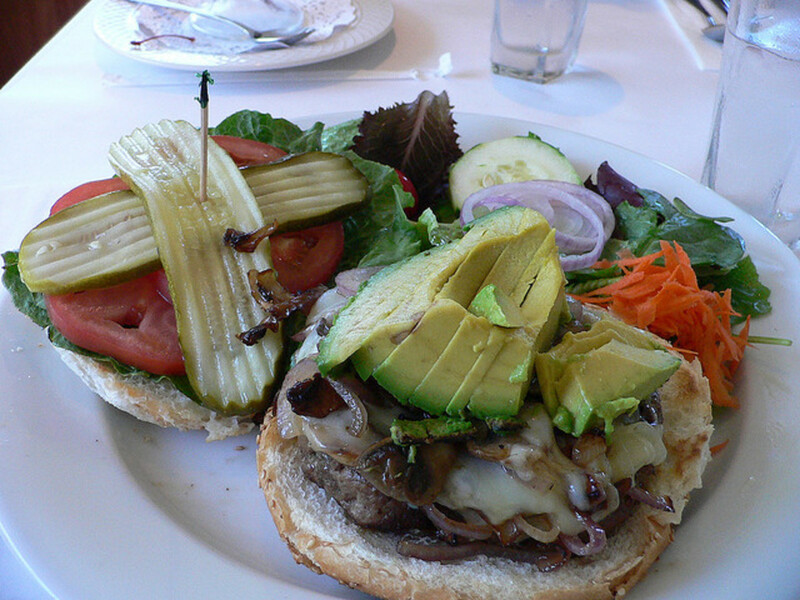 Place burgers on buns. Top with cheese sauce and chopped poblano. Ingredients: Beets, ground sirloin, parsley, garlic, Worcestershire sauce, salt and pepper, olive oil, goat cheese; sour cream, crème fraîche or Greek yogurt; thyme, dill, lemon peel, crusty rolls, red onion, red leaf lettuce. Directions: Cook and drain beets. Combine ground beef, parsley, garlic, Worcestershire sauce, salt and pepper. Cook patties in skillet with olive oil. Combine goat cheese, sour cream, thyme, dill, lemon peel, and parsley. Place patties on roll, and top with beet slices, goat cheese mixture, onion, and lettuce. Ingredients: Prepared coleslaw,chopped pickledjalapeño chiles, chopped sun dried tomatoes, chipotle chile in adobo sauce, ground chuck, salt and pepper, pepper jack cheese slices, butter, onion rolls, red onion, chili flavored kettle potato chips. Directions: Combine coleslaw and jalapeños. In another bowl, combine sun-dried tomatoes and chipotle chile and adobo sauce. Combine ground beef, salt and pepper and form patties. Grill and top with cheese. Spread butter on rolls and toast. Spread tomato-chipotle mixture on roll tops and bottoms. Top bottom with red onion, potato chips, patty, and coleslaw. Ingredients: Olive oil, shiitake mushrooms, salt and pepper, onion, lean ground beef, low fat mayonnaise, tomato paste or chipotle chiles in adobo sauce, small potato rolls, romaine lettuce, extra sharp cheddar cheese, dill pickles. Directions: Cook mushrooms seasoned with pepper in skillet in olive oil and water. Cool and finely chop. Cook onions seasoned with pepper in olive oil in skillet. Combine ground beef, chopped mushrooms, salt, and half of onions and form into patties. Combine remaining onion with mayo and tomato paste. Grill patties and top with cheese. Spread sauce on roll halves. Top with two patties, pickle slices, and lettuce. Ingredients: Ground sirloin, chopped parsley, chopped dill, chopped chives, Worcestershire sauce, salt, pepper, goat cheese or creamy cheese like Boursin, olive oil, sour cream, Dijon mustard, honey, Kaiser rolls, leaf lettuce, cucumber, radishes, red onion. Directions: Combine beef, parsley, dill, chives,Worcestershire sauce, salt and pepper. Form patties with cheese in the center. Drizzle with olive oil and grill. Combine sour cream, mustard, honey, salt and pepper. Top rolls with lettuce, cucumber, radish, onion, and burger. Spread honey mustard sauce on top bun. Ingredients: Potatoes cut into wedges, olive oil, grill seasoning, sliced white mushrooms, onion, ground sirloin, coarse black pepper, dry red wine, butter, flour, beef broth, Worcestershire sauce, chopped baby spinach, gorgonzola cheese, sour cream, applesauce, horseradish, bread crumbs. Directions: Toss potato wedges with olive oil and grill seasoning and roast in the oven. Cook mushrooms and onion in skillet in olive oil with salt and pepper. Season ground beef with pepper, and form into patties. Pour wine into a dish, dip each patty in wine, then fry in skillet. Transfer patties to plate and top with mushrooms and cover with foil. Reduce wine to a syrup in skillet. Whisk in butter, flour, beef broth, and Worcestershire sauce. Heat mushrooms with olive oil, then add spinach and cook until wilted. Toss in gorgonzola. Combine sour cream, applesauce, horseradish, and bread crumbs for dipping sauce. 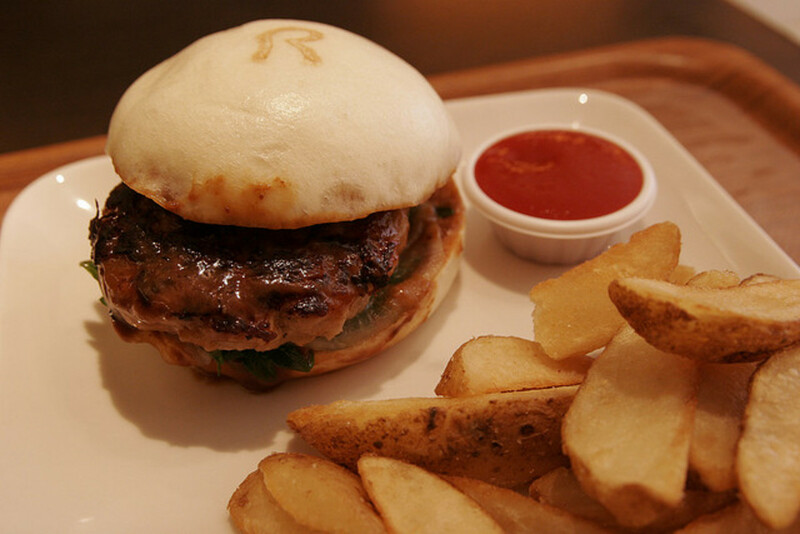 Serve burgers with wine reduction, spinach and potatoes, and dipping sauce. Ingredients: Ground beef, Campbell’s French Onion Soup, sliced cheese, Pepperidge Farm sandwich buns with sesame seeds. 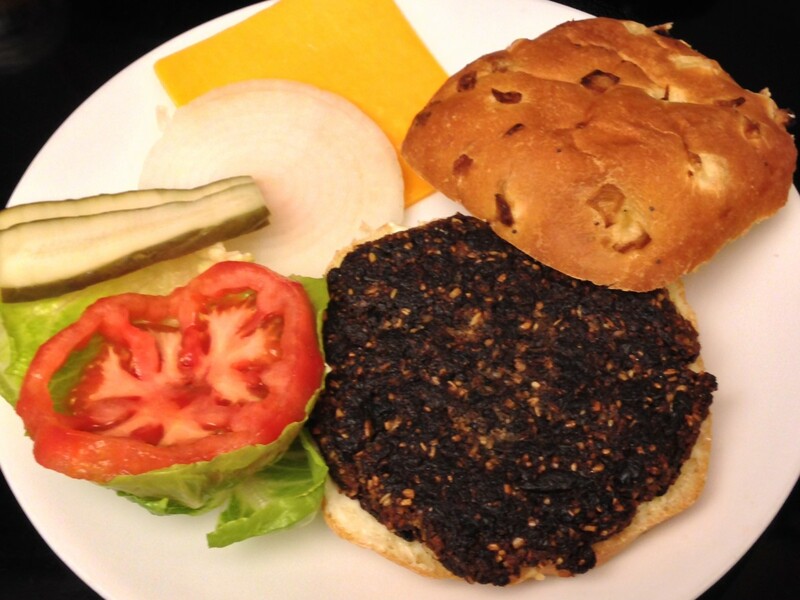 Directions: Form ground beef into patties and brown on both sides in skillet. Remove from skillet. Heat soup in skillet and return burgers and cook. Top burgers with cheese, serve on buns and use soup for dipping. Ingredients: Butter, chopped onion, thyme, salt and pepper, ground sirloin, Worcestershire sauce, olive oil, Swiss cheese slices, sandwich bread, Dijon mustard, chicken stock, chopped parsley. Directions: Melt butter in skillet. Add onion, thyme, salt and pepper and cook until onion is browned. Combine sirloin with Worcestershire sauce, salt and pepper. Form into patties and cook in skillet in olive oil. Top with cheese. Toast bread and spread with butter. Stir mustard and chicken stock into onions. Stir in parsley. Place patties on buttered toast and top with onion mixture. Ingredients: Ground sirloin, chopped onion, breadcrumbs, beaten egg, milk, salt and pepper, garlic powder, toasted hot dog buns, mustard, ketchup, relish, sliced onions. Directions: Combine ground beef, onion, breadcrumbs, egg, milk, salt, pepper, and garlic powder. Shape meat to resemble frankfurter. Cook on baking sheet. Serve in hot dog buns with condiments. Ingredients: Ground beef, lemon zest and juice, grated ginger, garlic, sugar, salt and pepper, olive oil, coleslaw cabbage mix, parsley, Kaiser rolls. Directions: Mix ground beef, lemon zest, ginger, garlic, sugar and salt. Form into patties and refrigerate. Whisk together olive oil, lemon juice, and sugar. Mix in coleslaw mix, parsley, salt and pepper. Cook garlic in olive oil in skillet. Brush on roll halves. Grill patties, place on rolls, and top with slaw. Ingredients: Ground sirloin, black beans, white or brown rice, grill seasoning, ancho chili powder, cumin, coriander, vegetable oil, avocado, red onion, seeded and choppedjalapeño chile or Serrano chile, grated garlic, lime juice and peel, sour cream, crusty rolls, red leaf lettuce, sliced tomato. Directions: Combine ground beef, beans, rice, grill seasoning, chili powder, cumin and coriander. Form into patties and cook in skillet. In a bowl, mash avocado and combine with onion, jalapeño, garlic, lime juice and peel. Mix in sour cream. Serve burgers on rolls with lettuce, tomato, and guacamole. Ingredients: Garlic cloves, fresh basil, pine nuts, olive oil, onion, ground chuck, crushed red pepper, salt, brie cheese, Kaiser rolls. Directions: Make pesto in food processor with garlic, basil, pine nuts, and olive oil. Cook onions in olive oil in skillet. Combine ground beef, red pepper, and salt. Form into patties, brush with olive oil, and grill. Top with cheese. Grill rolls and spread pesto on bottoms. Top with patties and onions. Ingredients: Blue potatoes, salt and pepper, stilton cheese, heavy cream, chopped chives, ground sirloin, Worcestershire sauce, garlic cloves, grated onion with juice, chopped parsley, olive oil, butter, sliced cremini mushrooms, watercress. Directions: Boil potatoes, then drain and mash with cheese, cream, chives, salt and pepper. Combine ground beef, Worcestershire sauce, garlic, onion, parsley, salt and pepper. Form into patties and brush with olive oil. 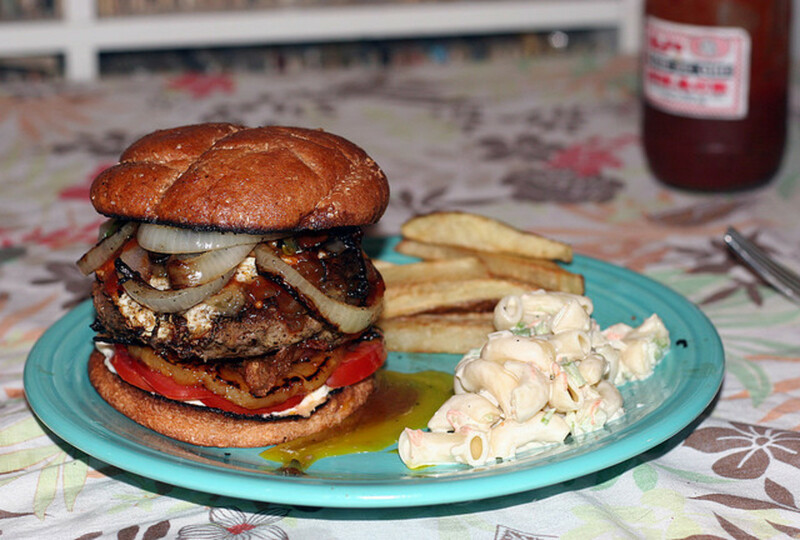 Cook burgers in cast iron skillet. In another skillet, heat butter and cook onions until soft. Add mushrooms and cook with salt and pepper. Top burgers with watercress and onion-mushroom mixture. Serve with blue potatoes. Ingredients: Cherry or grape tomatoes, shallots, olive oil, salt and pepper, ground sirloin, parsley, garlic, butter, flour, milk, provolone cheese, arugula, lemon juice. Directions: Roast tomatoes and shallots in oven. Combine ground beef, parsley, and garlic. Form into patties and fry in skillet in olive oil. Melt butter in saucepan and whisk in flour. Whisk in milk and cook until thickened. Add in provolone stirring until smooth. Season with salt and pepper. Toss arugula with olive oil and lemon juice. Toss with warm tomatoes and shallots. Serve burgers with arugula salad and provolone cheese sauce for dipping. Ingredients: Olive oil, thinly sliced fingerline potatoes, chopped carrot, chopped celery, chopped onion, bay leaf, chopped thyme leaves, salt and pepper, tomato paste, butter, flour, beef stock, coarsely ground sirloin, chopped parsley, Worcestershire sauce, sourdough English muffins, white cheddar cheese, chopped chives. Directions: Heat olive oil in saucepan. Add potatoes, carrots, celery, onions, bay leaf, thyme, salt and pepper, and cook covered for 10 min. Add tomato paste and stir to combine. Make a center well and melt butter. Add flour and stir one minute. Add beef stock and cook 5 min. Discard bay leaf. Mix ground beef with parsley, Worcestershire sauce, salt, and pepper. Form patties and fry in skillet with olive oil. Toast English muffins. Place beef patties and top with vegetable stew, cheese, and chives. Ingredients: Sour cream, applesauce, bread crumbs, horseradish, chopped chives, salt and pepper, ground sirloin, Worcestershire sauce, chopped parsley, olive oil, Kaiser rolls, watercress. Directions: Combine sour cream, applesauce, horseradish, chives, and pepper. Refrigerate. Combine ground beef, Worcestershire sauce, parsley, salt and pepper. Form patties and brush with oil. Cook in skillets. Place on rolls and top with watercress, horseradish sauce, and chives. Ingredients: Bacon, salt and pepper, potato or brioche buns, mayonnaise, ketchup, cheddar or American cheese slices, tomato slices, baby romaine. Serve with lager beer like Samuel Adams Boston Lager, zinfandel, or red wine. Directions: Cook bacon until crisp and coarsely chop. Mix with ground beef, salt and pepper. Trim buns to fit flat on grill. Spread mayo and ketchup on both sides of buns. Place cheese on bottoms. Put buns together and place on cooler portion of grill, and grill about 2 minutes per side. Grill patties and place on buns with lettuce and tomato. Ingredients: Plum tomatoes, olive oil, salt and pepper, sugar, pancetta, red onion, ground sirloin, garlic, parsley, Kaiser rolls, butter, Parmigiano-Reggiano cheese, romaine lettuce. Directions: Roast sliced plum tomatoes in the oven with olive oil. Sauté chopped pancetta and onion. In a bowl combine pancetta, onion, ground beef, minced garlic, chopped parsley, salt and pepper. Cook patties in skillet in olive oil. Toast buns under broiler. Brush bread with melted butter and top with cheese and return to broiler. 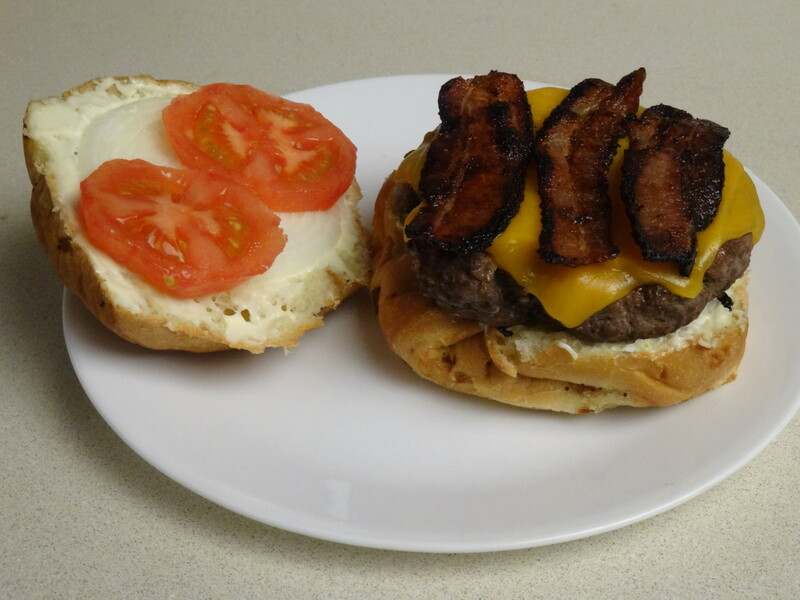 Serve burgers on buns with lettuce and broiled tomatoes. Ingredients: Hickory smoked bacon, olive oil, sweet onion, chipotle chile sauce, ground beef, cumin, garlic and herb spreadable cheese, Kaiser rolls, blue cheese, iceberg lettuce. Directions: Cook bacon until crisp and remove from skillet. Caramelize onions in olive oil. Stir in chipotle chile sauce. Set aside. Mix beef with 1/3 of onion mixture, chipotle sauce and cumin. Form patties and sprinkle with cumin. Cook in skillet. In saucepan combine garlic and herb cheese and blue cheese and warm until soft. Toast rolls under broiler. Spread with cheese spread and top with patty, lettuce, onions and bacon. Ingredients: Jalapeño chiles, bacon, ground chuck, salt and pepper, queso fresco (or feta or goat cheese), mayonnaise, buttermilk, olive oil, avocados, cilantro, onion, hamburger buns. Directions: Char and soften chiles in cast iron skillet. Cool, remove skin and seeds, and finely chop. Cook bacon until crisp, and chop. Reserve one tablespoon of bacon drippings. Combine bacon and drippings, ground beef, and half of chiles. Form patties and season with salt and pepper. Combine queso fresco, mayo, buttermilk, olive oil and remaining chiles. Season with salt and pepper. Cover and refrigerate. Toss avocados, cilantro, onion, and olive oil. Grill burgers and buns. Place burger on bun and top with avocado mixture and queso dressing. Ingredients: Bacon, thousand island dressing, chopped dill pickles, red onion, seeded and chopped jalapeño chiles, ground chuck, salt, sliced American cheese, deli rolls, iceberg lettuce, sweet potato fries. Directions: Cook bacon in skillet until crisp. Cool and crumble. Combine in bowl with dressing, pickles, onion, and jalapeños. 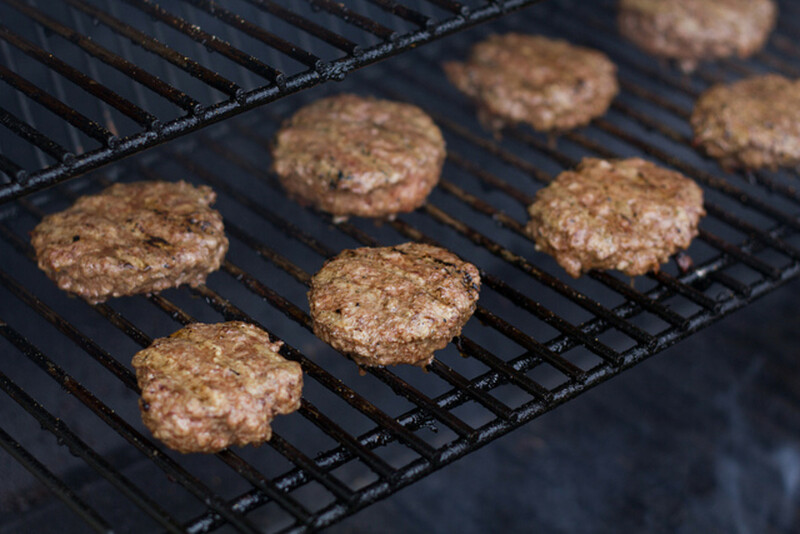 Season ground beef with salt, form into patties, and grill. Top with cheese. Place patties on roll. Top with dressing. Pile high with lettuce and fries and cover with top roll. Ingredients: Bacon, lean ground beef, chopped shallot, chopped parsley, salt and pepper, olive oil, butter, flour, Worcestershire sauce, mustard, hot sauce, stout such as Guinness beer or white wine, cheddar cheese or Swiss, pumpernickel bread, chopped watercress, sliced beefsteak tomato, vinegar and salt potato chips. Directions: Bake bacon until crisp. Combine ground beef, shallot, parsley, salt and pepper and form into patties. Fry in skillet in olive oil. Melt butter in saucepan. Whisk in flour until light brown. Stir in Worcestershire sauce, mustard, and hot sauce. Whisk in stout and cook until thickened. Stir in cheese until smooth. Toast bread on baking sheet. Pour sauce on bread and broil until bubbly. Place patties on four bread slices. Cover with watercress and 2 bacon slices. Top with tomato, salt and pepper. Cover with remaining toasted bread. Serve with potato chips. Ingredients: Ketchup, mayonnaise, red wine vinegar, Worcestershire sauce, salt and pepper, bacon, vegetable oil, white onion, ground chuck, Dijon mustard, American cheese slices, crusty rolls, dill pickles. Directions: Combine ketchup, mayonnaise, vinegar, Worcestershire sauce, salt and pepper. Bake bacon in oven until crisp, cool and chop. Cook onion in oil in skillet with salt and pepper. Add bacon. Combine ground beef, mustard, salt and pepper. Form patties and grill. Top with cheese. Place patties on rolls, and top with onion-bacon jam, ketchup sauce and pickles. Ingredients: Smoked bacon, olive oil, finely chopped yellow onions, thinly sliced yellow onions, ground sirloin (or ground turkey), Worcestershire sauce, hot sauce, McCormick Montreal Steak Seasoning, Kaiser rolls, Gouda cheese, steak sauce like A1 or Lea & Perrins. Directions: Cook bacon until crisp in skillet drizzled with olive oil. Reserve one tablespoon of bacon drippings and sweat finely chopped onions. Combine onions and bacon in a bowl. In skillet heat olive oil until hot. Add thinly sliced onions and cover, cooking until browned. Combine ground sirloin, Worcestershire sauce, hot sauce, and grill seasoning. Add cooked chopped onions and bacon and combine. Form into patties. Fry in olive oil in skillet. Toast rolls. Place patties on bottoms. Top with smoked Gouda and melt. 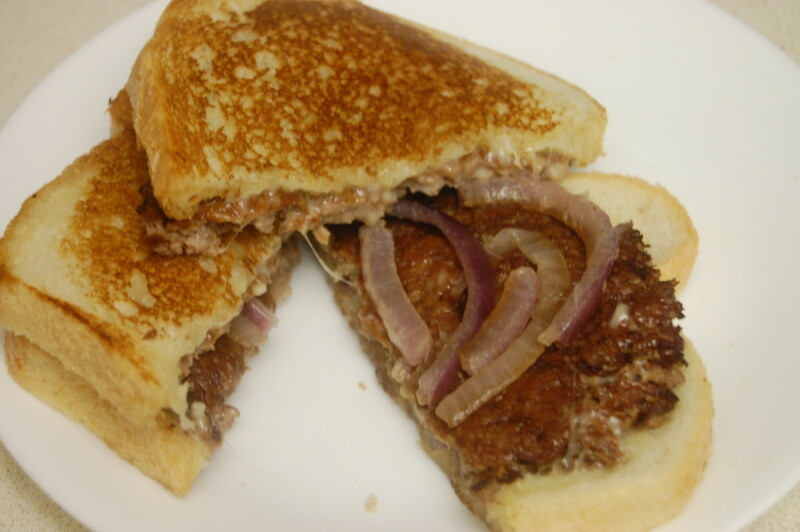 Combine sliced onions with steak sauce and top burgers. Ingredients: Smoked bacon, ground sirloin, Worcestershire sauce, horseradish, salt and pepper, extra sharp white cheese, sour cream, chopped parsley, chopped chives, chopped dill, Kaiser rolls, chopped watercress or arugula. Directions: Cook bacon in skillet until crisp. Reserve one tablespoon of drippings. Combine ground beef, Worcestershire, horseradish, salt and pepper. Form into patties and cook in skillet in bacon drippings. Melt cheese over patties. In a bowl, combine sour cream, parsley, chives, dill, and pepper. 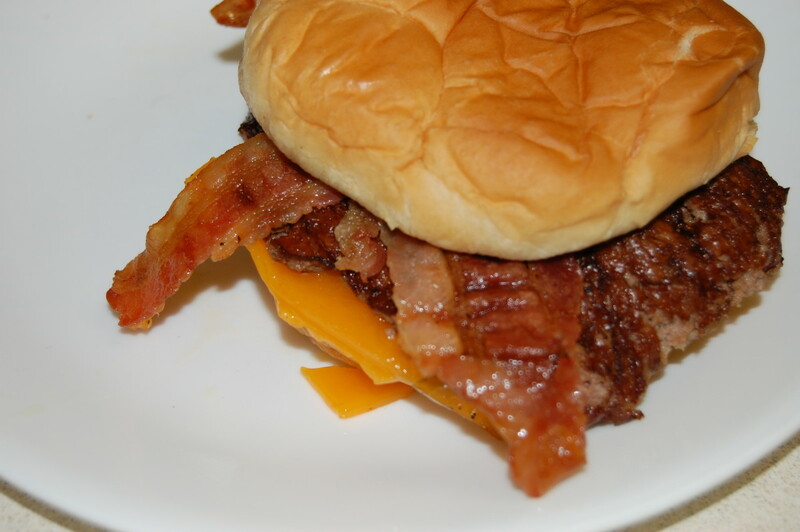 Place burgers with cheese on rolls. Top with bacon and watercress. Spread sour cream mixture on bun tops. Ingredients: Ground beef, pork and veal mix; salt and pepper, olive oil, chopped onion, chopped garlic, Italian crushed tomatoes, shredded basil leaves, butter, flour, milk, nutmeg,ricotta and Parmigiano-Reggiano cheese, and crusty rolls. Directions: Season meat mixture with salt and pepper and form into patties and brush. Cook onion until softened in a saucepan with olive oil. Add garlic. Stir in tomatoes and salt and pepper. Simmer and add basil. 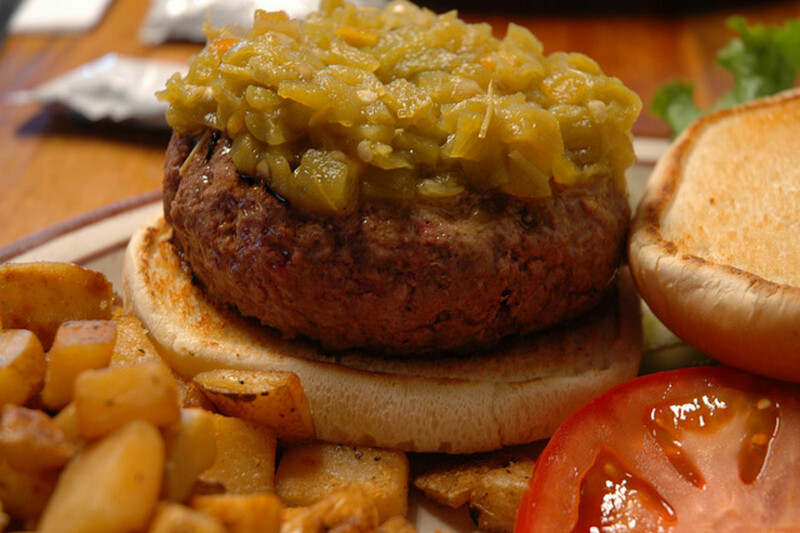 Fry burgers in olive oil. Melt butter in saucepan. Whisk in flour, then milk. Season with salt, pepper, and nutmeg and cook until thickened. Mix in thericotta and Parmigiano-Reggiano. Spoon some of tomato sauce on rolls and top with patties. Top patties with cheese sauce. Ingredients: Ground beef, sweet Italian sausage, coarsely chopped cooked spaghetti pasta, Parmesan cheese, marinara sauce, chopped garlic, Cajun seasoning blend, butter, sourdough bread. Directions: Combine ground beef, sausage, and spaghetti. Add cheese, marinara, garlic, and Cajun spice. Shape into patties. In a bowl, mix butter and garlic. Spread garlic butter on bread and grill. Grill patties and place on toasted bread. Ingredients: Ground veal or ground chicken, chopped garlic, fresh sage, salt and pepper, olive oil, prosciutto, fontina cheese, thick semolina bread, hearts of romaine lettuce, lemon juice. Directions: Mix ground veal, garlic, sage, salt and pepper. Form into patties and fry in skillet in olive oil. Top with prosciutto and fontina cheese. Toast bread. In a bowl, coat lettuce with olive oil, lemon juice, salt and pepper. Assemble burgers. Ingredients: Plum tomatoes, oregano, salt and pepper, olive oil, pancetta or bacon, ground sirloin, salami or soppressata bits, prosciutto, provolone, crusty rolls, arugula, basil, red onion. Directions: Roast tomatoes with oregano, salt, pepper, and olive oil. Brown pancetta in skillet. Place in bowl with ground beef. Add garlic parsley, salt, pepper. Chop salami and ham in food processor and add to the other meats. Form meat mixture into patties and fry in cast iron skillet with olive oil. Top with cheese. Place burgers on rolls, topped with tomatoes, arugula, basil, red onion and olive oil. Ingredients: Fennel head thinly sliced, white wine vinegar or white balsamic vinegar, sugar, salt and pepper, olive oil, seeded and chopped red bell peppers, chopped red onion, crushed garlic cloves, ground pork, ground beef, sweet smoked paprika, fennel seed, granulated garlic, granulated onion, sage, butter, crusty Italian rolls,Pecorino-Romano or Parmigiano-Reggiano cheese, basil. Directions: Place fennel in storage container with lid. In saucepan combine vinegar, water, sugar, and salt to boil. Pour over fennel and refrigerate for an hour. Cook bell peppers, onion, and garlic with salt, pepper, and olive oil in skillet. Sprinkle with sugar and vinegar. Season ground meat with salt, pepper, paprika, fennel seeds, granulated garlic and onion, and sage. Mix and form into oval patties. Drizzle with olive oil and grill. In saucepan, heat butter and crushed garlic in olive oil. Toast rolls under broiler. Brush tops with garlic butter and sprinkle cheese. Broil until lightly browned. Put basil on roll bottoms. Top with peperonata, meat patties, and pickled fennel. Ingredients: Ground pork, chopped honey-baked ham, maple syrup, grill seasoning, hot pepper sauce, dry mustard, olive oil, fresh pineapple slices, Kaiser rolls, pineapple or mango chutney, red leaf lettuce, red onion. Directions: Combine ground pork, ham, syrup, grill seasoning, hot sauce, and mustard. Form into patties. Cook pineapple slices in skillet in olive oil. Then fry patties in olive oil. Place patties on roll. Top with chutney, lettuce, pineapple, and onion. Ingredients: Mayonnaise, lime juice, cumin, ground pork, grill seasoning, ham, Swiss cheese, challah rolls, iceberg lettuce, dill pickle slices. Directions: Combine mayo, lime juice, and cumin and set aside. 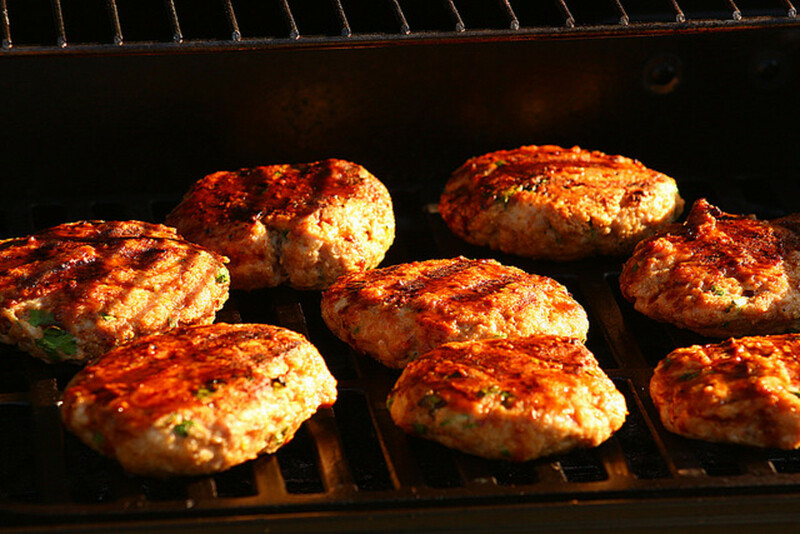 Combine ground pork and grill seasoning and form into patties. Grill patties. Top patties with ham and cheese. Spread mayo mixture on rolls. Top with lettuce and pickles and cover with top roll. 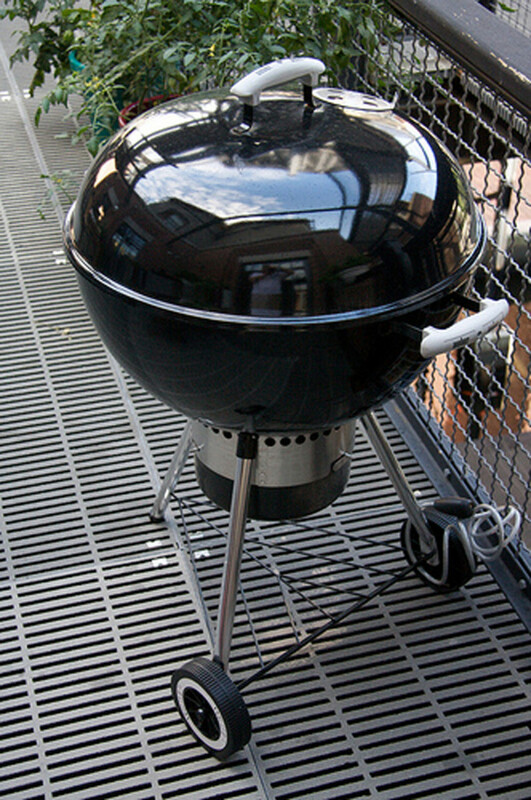 Arrange sandwiches on grill and top with heavy pan. Cook until grill marks appear, turn and repeat. Ingredients: Red grapefruits, balsamic vinegar, honey, scallions, avocado, ground pork, onion powder, salt, butter, onion rolls. Directions: Peel and section grapefruit. Squeeze out juice into saucepan. Add vinegar and honey and simmer down to a syrup. Add grapefruit sections. Char scallions on griddle. Cool and slice. Add scallions and avocado to grapefruit. Combine ground pork, onion powder, and salt. Form into patties and grill. Butter rolls and grill to toast. Place patties on rolls. Top with grapefruit avocado mixture. Ingredients: Grated Granny Smith apples, lemon juice and peel, mayonnaise, chives, maple syrup, Jamaican Jerk seasoning, ground pork, applewood smoked bacon, smoked cheddar cheese, Kaiser rolls. Directions: Toss apples with lemon in medium bowl. Add mayonnaise, chives, syrup, and jerk seasoning. Mix and refrigerate. In large bowl, whisk together syrup and jerk seasoning. Combine with ground pork. Form patties. Cook bacon in skillet until crisp. Reserve drippings. Fry pork patties in bacon drippings. Top with cheese. Assemble burgers with bacon and apple slaw. Ingredients: Eggplant, head of garlic, olive oil, salt and pepper, rosemary, mint, lemon juice, ground lamb, parsley, chives, sweet smoked paprika or harissa, cumin, coriander, Emmentaler cheese; Mediterranean flatbread, English muffins or brioche rolls, leaf lettuce, tomato, red onion. Directions: Slit eggplant with knife to vent and roast in oven until tender. Remove two cloves of garlic and mince. Roast remaining head of garlic in oven, drizzled with olive oil, salt and pepper. Squeeze roasted garlic into food processor. Add eggplant flesh. Process garlic, eggplant, mint, lemon juice, salt and pepper. Combine lamb with chopped garlic, parsley, chives, paprika, cumin, coriander, salt and pepper. Form lamb mixture into patties and fry in skillet with olive oil. Top patties with cheese. Spread eggplant puree to roll tops. Place burgers, lettuce, tomatoes, and onions on bottom roll. Ingredients: Ground lamb, harissa or red chili paste, chopped garlic, lemon peel, coriander, cumin, cinnamon, salt and pepper, olive oil, Greek yogurt, chopped fresh mint, chopped scallion, white wine or apple cider vinegar, coleslaw cabbage mix, red onion, crusty rolls. Directions: Combine ground lamb, harissa, garlic, lemon peel, coriander, cumin, cinnamon, salt, and pepper. Form into patties, brush with olive oil, and grill. In a bowl combine yogurt, mint, scallions and salt. In a large bowl whisk together olive oil and vinegar. Add cabbage, red onion, salt and pepper and toss to coat. Pile slaw on bun. 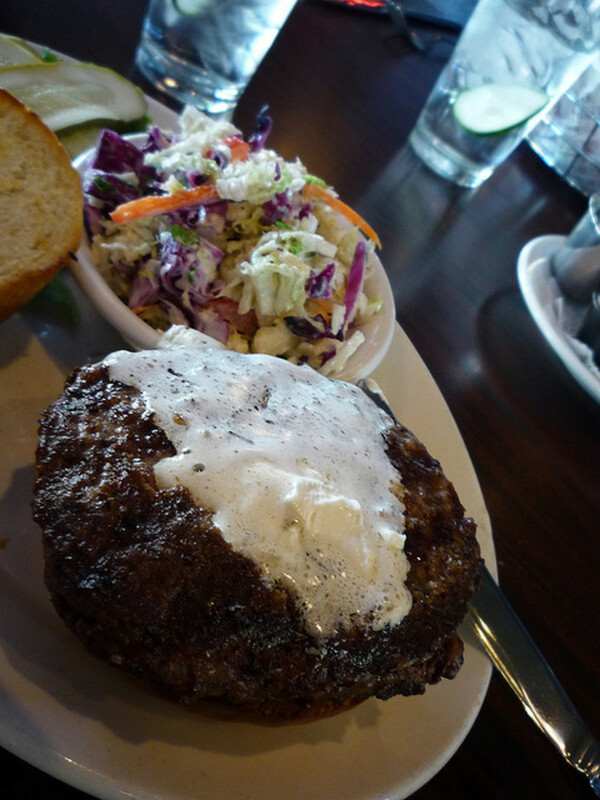 Top with burger and yogurt sauce. Ingredients: Olive oil, chopped onion, chopped garlic, chopped watercress, salt and pepper, curry powder, mayonnaise, ground lamb, pumpernickel rolls, radishes. Directions: Sauté onions in olive oil. Add garlic. Add watercress and cook to wilt. Toast curry powder in dry skillet. Add garlic and cook. Transfer to bowl to cool. Stir in mayo. Combine lamb, salt, pepper. Make a mound and insert watercress mixture and shape lamb around it. Gently press to form a patty. Fry patties in skillet. Spread curry mayo on bottom rolls. Top with patty, more mayo, radishes, and watercress. Ingredients: Olive oil, chopped eggplant, chopped garlic, tahini, lemon juice and peel, salt and pepper, ground lamb, chopped parsley or cilantro, coriander, cumin, turmeric, cinnamon, toasted crusty rolls or pita pockets, romaine lettuce. Directions: Cook eggplant and garlic in skillet with olive oil. Cool and transfer to food processor. Add tahini, lemon, salt and pepper and puree. Combine lamb, parsley, coriander, cumin, turmeric, cinnamon, salt and pepper, and form into patties. Fry in skillet in olive oil. Spread roll with eggplant mixture. Top with burger and lettuce. Ingredients: Ground lamb, feta cheese, oregano, salt and pepper, olive oil, Portobello mushroom caps, red onion, thick Italian bread slices, balsamic vinegar. Directions: Combine lamb, feta, oregano, salt, pepper and shape into patties. Brush mushrooms, onion, and bread with olive oil. Season vegetables and patties with salt and pepper and grill covered. Grill bread to toast. Top bread with patty, mushroom cap, onion and vinegar. 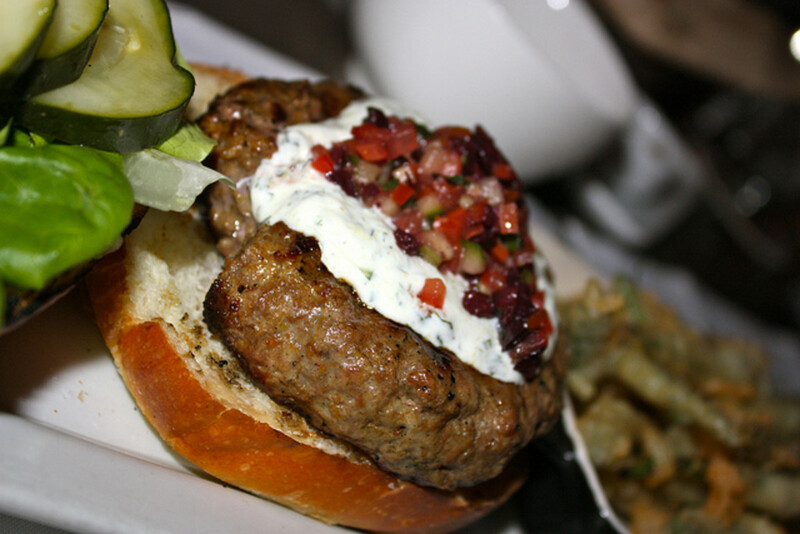 Ingredients: Ground lamb (or ground beef), grill seasoning, fennel seeds, oregano, cumin, crushed red pepper, olive oil, cucumber, garlic, Greek yogurt, feta, lemon juice, Kaiser rolls, romaine lettuce, tomato, red onion, olive oil potato chips. Directions: Combine lamb, grill seasoning, fennel, oregano, cumin, and red pepper. Form into patties and fry in olive oil in skillet. Grate cucumber and garlic in food processor. Add yogurt, feta, and lemon juice. Spread cucumber sauce on bottom and tops of rolls. Top with burgers, lettuce, tomato, red onion. Serve with potato chips. Ingredients: Philadelphia Cream Cheese or Spinach & Artichoke Cream Cheese Spread, chopped chives and parsley, ground lamb, Worcestershire sauce, salt and pepper, olive oil, onion rolls, watercress. Directions: Mix cream cheese and herbs. Roll into balls and flatten on waxed paper. Refrigerate. Combine ground lamb, Worcestershire sauce, salt and pepper. Place each cream cheese disk between two thin lamb patties and press to seal edges. Fry patties in skillet. Serve on rolls with watercress. Ingredients: Roasted red peppers, chopped cucumber, feta cheese, Greek yogurt, garlic clove, lemon juice, ground lamb, chopped onion, chili powder, oregano, paprika, garlic powder, cinnamon, salt and pepper, olive oil, romaine lettuce, crusty rolls, thinly sliced bell peppers, red onions, tomatoes, and fresh chiles. 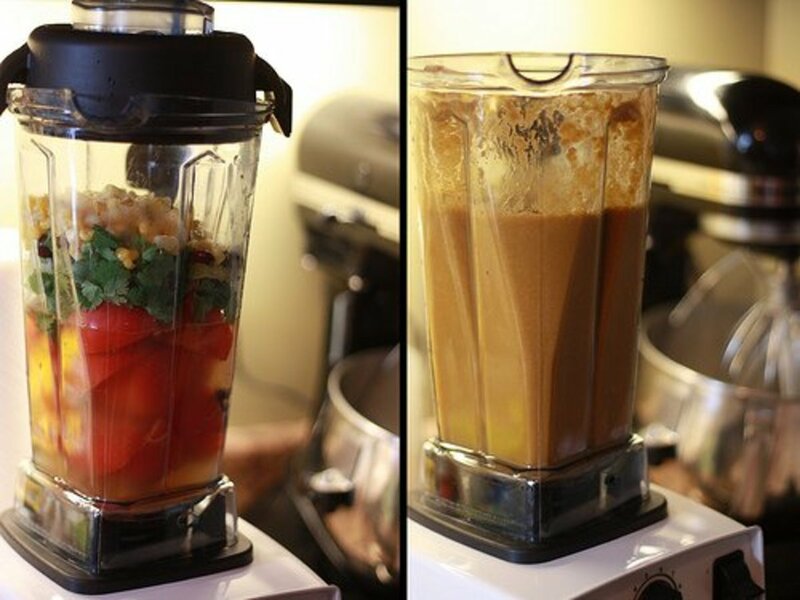 Directions: Puree roasted peppers, cucumbers, feta, yogurt, garlic and lemon juice in food processor. In bowl, combine lamb, onion, chili powder, oregano, paprika, garlic powder, cinnamon, salt and pepper. Form in to patties and fry in skillet in olive oil. Serve on rolls with vegetables and cucumber sauce. Ingredients: Feta cheese, lemon juice and zest, olive oil, ground lamb, pomegranate seeds, arugula, chopped mint, salt, hamburger buns, red onion. Directions: Combine ground lamb, pomegranate seeds, and feta. Form patties and cook in olive oil on griddle. In a bowl mash feta, lemon juice, and oil. In another bowl, toss arugula with mint, olive oil, lemon juice, and salt. Spread feta mixture on buns, top with burger, onion, and arugula salad. jenubouka I have another hub with 28 Rachael burger recipes with chicken, turkey, salmon or tuna, and another with 32 veggie burger recipes. Thanks for the love mattandangela! I also have a hamburger index for burgers made with salmon, tuna, chicken, or turkey. I have a vegetarian burger index too. cookie, you will find many hubbers will delete comments that have any kind of link. If you want to attract followers, one of the best ways is to participate in the forums in a way that contributes to the conversation, and does not self promote. People will start noticing you, get curious, and check out your profile. Make sure your profile page is interesting. Hello Paradise. Good to hear from you. 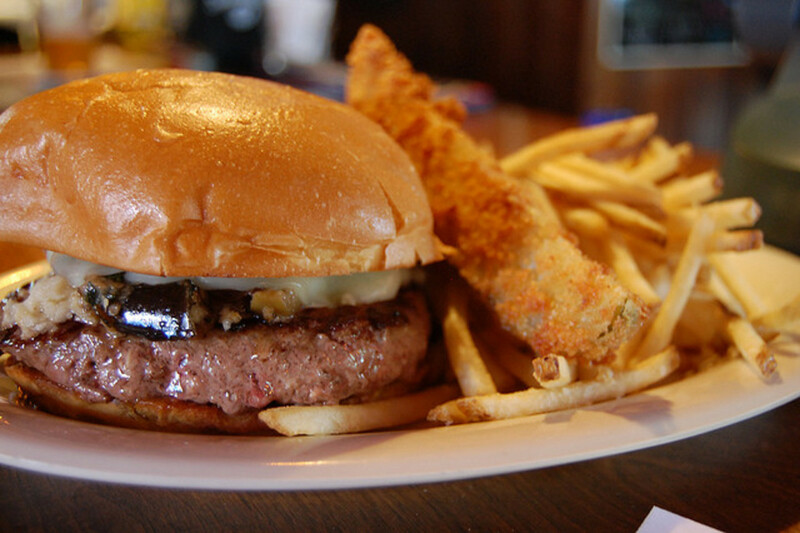 Let's just be lazy and head to the local hole in the wall burger joint! All those burgers look great. Makes me hungry! Thanks Simone. Would you believe I was working on this hub (on MS Word), having no idea that it would fit in with the weekly topic?! I have a follow-up hub idea. Are you leaving the question open? Oh heavenly, heavenly listing! I love the range- from conventional burgers to things I'd neve seen served or prepared before, like the patty melt burger, which looks DELICIOUS! Awesome, awesome Hub. Thanks so much for creating it!